As reported by the Federal Reserve earlier this month, the debt loads for Americans have once more surpassed their peak before the Great Recession. However, few experts are worried since consumers should have a much easier time managing this debt. The new high of $13.3 trillion, reached in June 2018, surpasses the prior peak of $12.7 trillion set in 2008. By far, the largest amount of debt was for household mortgages, with student loans, auto loans, and credit card debt also contributing to the total. Household debt had been climbing steadily since 2013, when it had declined modestly from the pre-recession peak. Now however, debt loads continue on an upward trajectory and should be breaking new records soon. Why Is There No Concern? High debt loads can contribute to economic recessions, just as they did a decade ago. Consumers strapped for cash will default on many debt payments, which can cause large lenders to collapse or need a government bailout. As these companies cut jobs, a vicious cycle is created, where rising unemployment puts a damper on consumer spending. 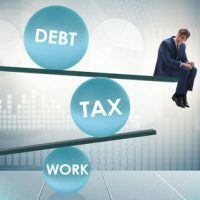 However, as experts pointed out, consumers are well positioned to handle this new debt because their household incomes are much higher today than they were a decade ago. According to the Federal Reserve, total household debt in 2008 equaled almost 140% of average household income. Today, by contrast, total debt equals only around 103% of household income. Based on that metric, the debt burden today is comparable to what it was in the late 1990s. This means that consumers need to use less of their income to service their debt, even if debt loads today are higher than they were 10 years ago. What are Americans doing with the money they aren’t putting toward debt service? Saving. In 2005, Americans saved only 2.5% of their income. Today, they are saving nearly three times that—about 7%. With this extra cash cushion, consumers are better able to withstand a temporary job layoff or a reduction of hours and still continue to make their debt payments. Of course, not everyone has enjoyed the fruits of economic expansion over the past 10 years. Some consumers continue to be saddled with debt and are unable to save for emergencies or even afford daily necessities. Nevertheless, the economic outlook generally is very good for the country as a whole, even if the topline debt number is creeping ever higher. If the economic recovery has passed you by, or if you are drowning in unexpected debt, help is available. At Nowack & Olson, we do consumer bankruptcies. We have helped hundreds of clients put medical bills, credit cards, and personal loans behind them as they seek a new financial start. To discuss your options with a Plantation bankruptcy attorney, please contact us today. You can call 866-907-2970 or send us an online message. Our initial consultations are completely free and confidential.